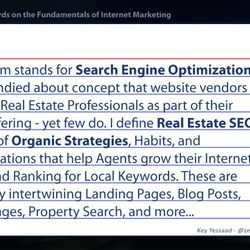 Important Real Estate SEO Glossary Terms Real Estate Agents Must Know to Enhance their Internet Presence, Online Marketing, and Digital Visibility. 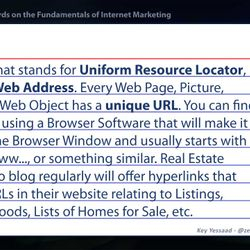 I have decided to embark on a project in which I give short definitions for 'Internet Marketing Terms' that Real Estate Agents must become familiar with. 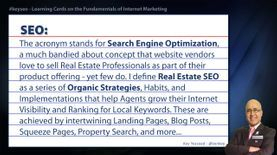 The main idea is to demystify the main concepts in Real Estate SEO and bring it into the light of understanding. The focus will be primarily on Real Estate and its relationship to Internet Marketing, Lead Generation, Web Services, Internet Ranking, and Social Media. Remember this is an ongoing project and this Glossary Page will grow on a weekly basis. 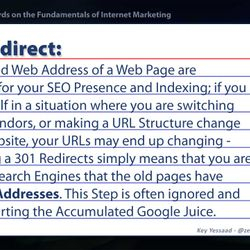 301 Redirect: The Age and Web Address of a Web Page are important for your SEO Presence and Indexing; if you find yourself in a situation where you are switching Website Vendors, or making a URL Structure change to your website, your URLs may end up changing - Performing a 301 Redirects simply means that you are notifying Search Engines that the old pages have new Web Addresses. This Step is often ignored and ends up hurting the Accumulated Google Juice. 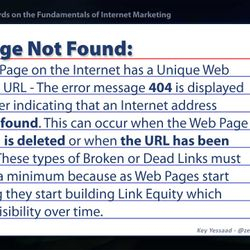 404 Page Not Found: Every Web Page on the Internet has a Unique Web Address, or URL - The error message 404 is displayed by a browser indicating that an Internet address cannot be found. This can occur when the Web Page in question is deleted or when the URL has been changed. These types of Broken or Dead Links must be kept at a minimum because as Web Pages start interlinking they start building Link Equity which increases Visibility over time. 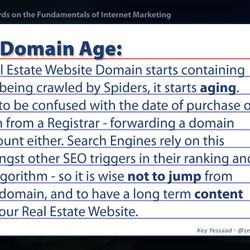 Age or Domain Age: Once a Real Estate Website Domain starts containing pages and being crawled by Spiders, it starts aging. This is Not to be confused with the date of purchase of the domain from a Registrar - forwarding a domain does not count either. Search Engines rely on this factor amongst other SEO triggers in their ranking and indexing algorithm - so it is wise not to jump from domain to domain, and to have a long term content vision for your Real Estate Website. 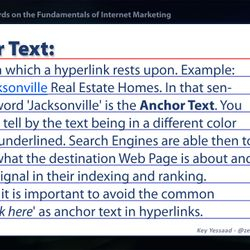 Anchor Text: The Text on which a hyperlink rests upon. Example: Search Jacksonville Real Estate Homes. In that sentence the word 'Jacksonville' is the Anchor Text. You can usually tell by the text being in a different color and being underlined. Search Engines are able then to make out what the destination Web Page is about and use it as a signal in their indexing and ranking. This is why it is important to avoid the common phrase 'click here' as anchor text in hyperlinks. 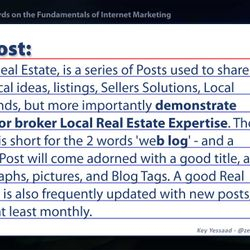 Blog Post: A Blog, in Real Estate, is a series of Posts used to share relevant local ideas, listings, Sellers Solutions, Local Market Trends, but more importantly demonstrate the agent or broker Local Real Estate Expertise. The word Blog is short for the 2 words 'web log' - and a good Blog Post will come adorned with a good title, a few paragraphs, pictures, and Blog Tags. A good Real Estate Blog is also frequently updated with new posts, weekly or at least monthly. Bounce Rate: The percentage of Visitors who enter a website and bounce, meaning leave the site, rather than continue to other web pages within it - Google calls it the percentage of Single-Page Sessions. Real Estate Websites that offer Detailed Property Listings, Lots of Pictures, Local Real Estate Advice, Blog Posts, Maps, Local Lifestyle information, and Videos tend to be sticky and end up with a low bounce rate. 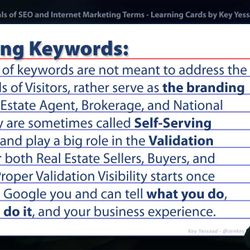 Branding Keywords: These type of keywords are not meant to address the direct needs of Visitors, rather serve as the branding of the Real Estate Agent, Brokerage, and National Brand. 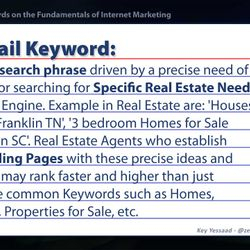 They are sometimes called Self-Serving Keywords and play a big role in the Validation Process for both Real Estate Sellers, Buyers, and Investors. Proper Validation Visibility starts once visitors can Google you and can tell what you do, where you do it, and your business experience. Breadcrumb Navigation: A Web Navigation Technique that reveals the relationship between each Sub-page to its Parent Web Page, to aid Visitors and Search Engines with site structure. 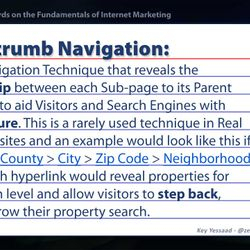 This is a rarely used technique in Real Estate Websites and an example would look like this if employed: County > City > Zip Code > Neighborhood > Type. Each hyperlink would reveal properties for sale at each level and allow visitors to step back, and/or narrow their property search. 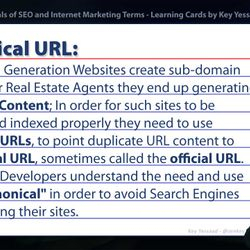 Canonical URL: When Lead Generation Websites create sub-domain versions for Real Estate Agents they end up generating Duplicate Content; In order for such sites to be crawled and indexed properly they need to use Canonical URLs, to point duplicate URL content to the original URL, sometimes called the official URL. Good Web Developers understand the need and use of rel="canonical" in order to avoid Search Engines from banning their sites. CMS: Stands for Content Management System - a set of tools given by full-fledged Real Estate Websites to aid is the construction of Web Pages, and Control of Navigation. Lead Generation Websites tend not to offer such tools. 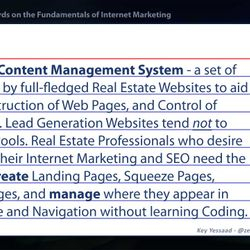 Real Estate Professionals who desire to control their Internet Marketing and SEO need the ability to create Landing Pages, Squeeze Pages, Listings Pages, and manage where they appear in the website and Navigation without learning Coding. Cookie: Modern Websites utilize Internet Cookies to track and help Web Visitors have a customized Experience dependent on their behavior. 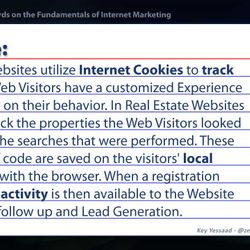 In Real Estate Websites Cookies track the properties the Web Visitors looked at, as well the searches that were performed. These snippets of code are saved on the visitors' local computer with the browser. When a registration occurs this activity is then available to the Website Owner for follow up and Lead Generation. CRM: Stands for Customer Relationship Management, a set of Database Tools used by Salespeople to manage customers' orders. 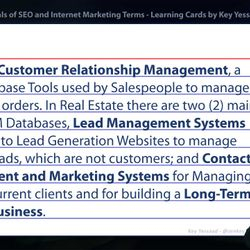 In Real Estate there are two (2) main sets of CRM Databases, Lead Management Systems connected to Lead Generation Websites to manage Internet Leads, which are not customers; and Contact Management and Marketing Systems for Managing past and current clients and for building a Long-Term Referral Business. CSS: Stands for Cascading Style Sheets, a layer language that describes the look and feel of a Web Page, as well as the precise positioning of HTML Attributes. 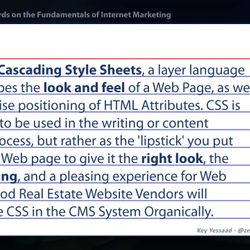 CSS is not meant to be used in the writing or content creation process, but rather as the 'lipstick' you put on top of a Web page to give it the right look, the right spacing, and a pleasing experience for Web Visitors. Good Real Estate Website Vendors will incorporate CSS in the CMS System Organically. 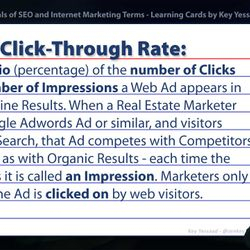 CTR or Click-Through Rate: It is the ratio (percentage) of the number of Clicks to the number of Impressions a Web Ad appears in Search Engine Results. 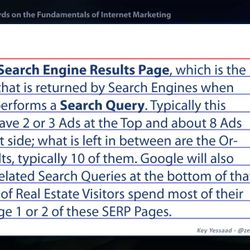 When a Real Estate Marketer runs a Google Adwords Ad or similar, and visitors preform a Search, that Ad competes with Competitors' Ads as well as with Organic Results - each time the Ad appears it is called an Impression. Marketers only pay once the Ad is clicked on by web visitors. 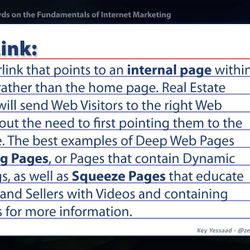 Deep Link: It is a hyperlink that points to an internal page within a website, rather than the home page. 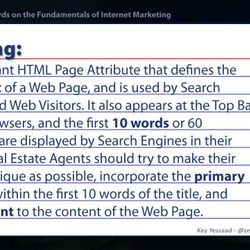 Real Estate Marketers will send Web Visitors to the right Web Pages without the need to first pointing them to the home page. The best examples of Deep Web Pages are Landing Pages, or Pages that contain Dynamic MLS Listings, as well as Squeeze Pages that educate the Buyers and Sellers with Videos and containing short forms for more information. Delayed Registration: The Technique of allowing Web Visitors to view the details of a few Real Estate Properties for Sale in your Website before a Registration Form appears Requiring Registration in order to proceed. Real Estate Lead Generation Websites all employ this technique in order to generate Leads. Because these are forced Registration I prefer calling them 'Internet Registrations.' The longer the Delay of the Registration Form the higher the quality of Registrant. 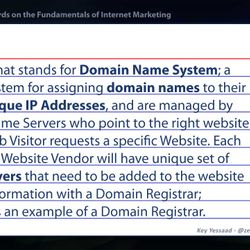 DNS: Acronym that stands for Domain Name System; a naming system for assigning domain names to their proper unique IP Addresses, and are managed by Domain Name Servers who point to the right website when a Web Visitor requests a specific Website. Each Real Estate Website Vendor will have unique set of Name Servers that need to be added to the website domain information with a Domain Registrar; Godaddy is an example of a Domain Registrar. 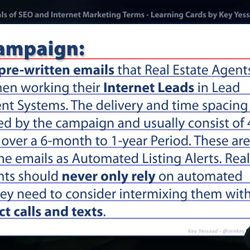 Drip Campaign: A series of pre-written emails that Real Estate Agents activate when working their Internet Leads in Lead Management Systems. The delivery and time spacing is automated by the campaign and usually consist of 4 to 6 emails over a 6-month to 1-year Period. These are not the same emails as Automated Listing Alerts. Real Estate Agents should never only rely on automated systems, they need to consider intermixing them with actual direct calls and texts. External Link: It is simply a hyperlink that points from one of your Web Pages to another Page in another website. 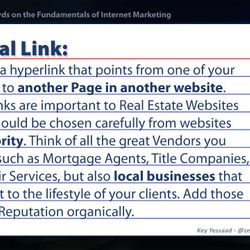 External Links are important to Real Estate Websites but they should be chosen carefully from websites with authority. Think of all the great Vendors you work with such as Mortgage Agents, Title Companies, Local Repair Services, but also local businesses that are relevant to the lifestyle of your clients. Add those with great Reputation organically. Hashtag: A word, but more often, a short phrase with no spaces preceded by the hash sign (#), also called the pound sign. Hashtags are used on Social Media to denote a Special Topic open to all to follow whether or not you are friends with them. Hashtags are very popular on Twitter and have found their way in Google+, Pinterest, and with limited support on Facebook. 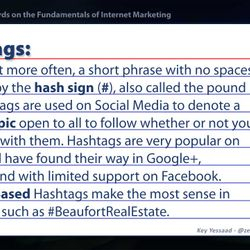 Location Based Hashtags make the most sense in Real Estate such as #BeaufortRealEstate. 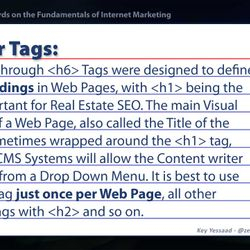 Header Tags: The <h1> through <h6> Tags were designed to define HTML Headings in Web Pages, with <h1> being the most important for Real Estate SEO. The main Visual Headline of a Web Page, also called the Title of the Page, is sometimes wrapped around the <h1> tag, and good CMS Systems will allow the Content writer to select it from a Drop Down Menu. It is best to use the <h1> Tag just once per Web Page, all other sub-headings with <h2> and so on. HTML: The language of Web Pages; it stands for HyperText Markup Language and allows for the 'authoring' on the World Wide Web. Authoring simply means writing using some computer language in this case using bracketed formatting tags <>. 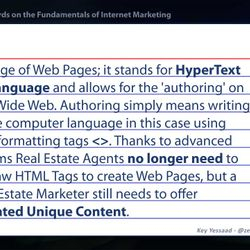 Thanks to advanced CMS Systems Real Estate Agents no longer need to learn the raw HTML Tags to create Web Pages, but a good Real Estate Marketer still needs to offer Differentiated Unique Content. 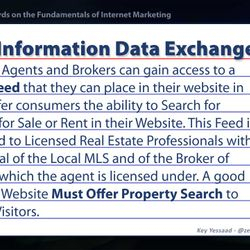 IDX or Information Data Exchange: Real Estate Agents and Brokers can gain access to a Listings' Feed that they can place in their website in order to offer consumers the ability to Search for Properties for Sale or Rent in their Website. This Feed is only offered to Licensed Real Estate Professionals with the approval of the Local MLS and of the Broker of Record for which the agent is licensed under. A good Real Estate Website Must Offer Property Search to their Web Visitors. 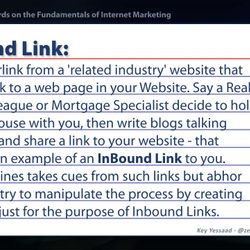 Inbound Link: It is a hyperlink from a 'related industry' website that points a link to a web page in your Website. Say a Real Estate Colleague or Mortgage Specialist decide to hold an Open House with you, then write blogs talking about you and share a link to your website - that would be an example of an InBound Link to you. Search Engines takes cues from such links but abhor those who try to manipulate the process by creating fake blogs or pages just for the purpose of Inbound Links. 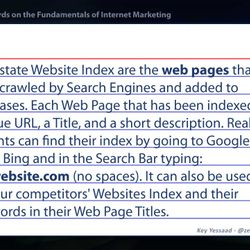 Index: Your Real Estate Website Index are the web pages that have been crawled by Search Engines and added to their databases. Each Web Page that has been indexed has a Unique URL, a Title, and a short description. Real Estate Agents can find their index by going to Google, Yahoo, and Bing and in the Search Bar typing: site:yourwebsite.com (no spaces). It can also be used to study your competitors' Websites Index and their Local Keywords in their Web Page Titles. 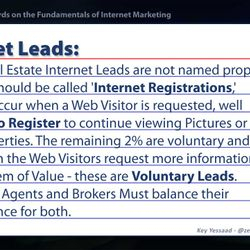 Internet Leads: 98% of Real Estate Internet Leads are not named properly, they should be called 'Internet Registrations,' and they occur when a Web Visitor is requested, well required to Register to continue viewing Pictures or other Properties. The remaining 2% are voluntary and occur when the Web Visitors request more information or for an item of Value - these are Voluntary Leads. Real Estate Agents and Brokers Must balance their Web Presence for both. 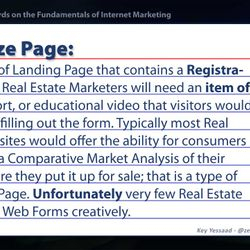 Landing Pages: As the phrase suggests these are Real Estate Web Pages of value that you wish your Web Visitors to Land On. 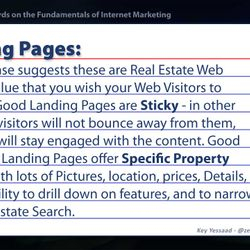 Good Landing Pages are Sticky - in other words the visitors will not bounce away from them, but rather will stay engaged with the content. Good Real Estate Landing Pages offer Specific Property Listings with lots of Pictures, location, prices, Details, and the ability to drill down on features, and to narrow their Real Estate Search. Long Tail Keyword: It is a long search phrase driven by a precise need of a Web Visitor searching for Specific Real Estate Needs in a Search Engine. Example in Real Estate are: 'Houses for Sale in Franklin TN', '3 bedroom Homes for Sale in Lexington SC'. Real Estate Agents who establish good Landing Pages with these precise ideas and Properties, may rank faster and higher than just chasing the common Keywords such as Homes, Real Estate, Properties for Sale, etc. Meta Description Tag: It is a Web Page Attribute that concisely describes the page to Search Engines, typically 2 sentences or about 30 words. 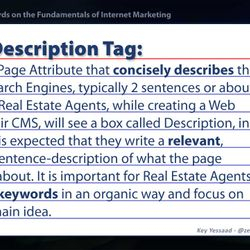 Real Estate Agents, while creating a Web Page in their CMS, will see a box called Description, in that box it is expected that they write a relevant, unique, 2 sentence-description of what the page content is about. 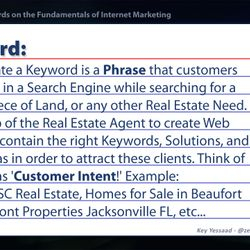 It is important for Real Estate Agents to include keywords in an organic way and focus on the page main idea. Navigation: Or more precisely, Website Navigation, are hyperlinks placed usually horizontally towards the top of a Real Estate Website to offer additional content, and help visitors Navigate the major sections of said Website. 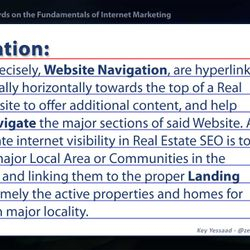 A way to create internet visibility in Real Estate SEO is to place the major Local Area or Communities in the Navigation and linking them to the proper Landing Pages – namely the active properties and homes for sale in each major locality. Nofollow: An HTML Attribute used by websites to prevent a link from passing Link Authority, or Link Juice. Many, if not all Real Estate Hubs, like Trulia, Zillow, Realtor, Activerain employ this attribute to prevent the passing of Ranking to Agents' and Brokers' website. The presence of this attribute is only visible if one views the HTML Source Code and it is written: rel="nofollow". 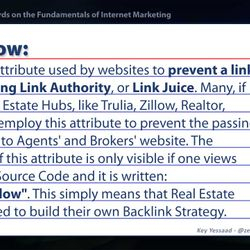 This simply means that Real Estate Agents Need to build their own Backlink Strategy. PPC or Pay-per-Click: The Advertising System that Real Estate Brokers and/or Agents employ to place ads in Search Results of Google, Bing, or Yahoo that only trigger a cost once a visitor clicks on the Ad. 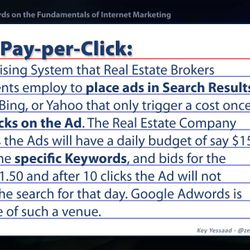 The Real Estate Company who places the Ads will have a daily budget of say $15, targets some specific Keywords, and bids for the clicks say $1.50 and after 10 clicks the Ad will not appear in the search for that day. Google Adwords is an example of such a venue. SERP: Stands for Search Engine Results Page, which is the Web Page that is returned by Search Engines when someone performs a Search Query. Typically this page will have 2 or 3 Ads at the Top and about 8 Ads on the right side; what is left in between are the Organic Results, typically 10 of them. Google will also offer you Related Search Queries at the bottom of that Page. 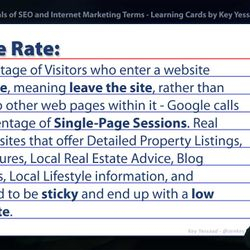 90% of Real Estate Visitors spend most of their time on Page 1 or 2 of these SERP Pages. Social Email: Email is still one of the most important communication tools Real Estate Agents must master; yet many run all of their communication through one (1) Email. A Social Email is a Web-based email managed by its owner that is used in all matters of Social Registrations, Internet Registrations, Web Services, but NOT for Direct One on One business with Buyers and Sellers. 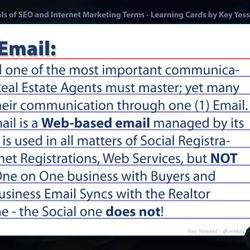 A Business Email Syncs with the Realtor Smartphone - the Social one does not! 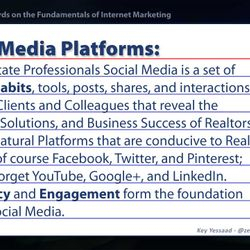 Social Media Platforms: For Real Estate Professionals Social Media is a set of websites, habits, tools, posts, shares, and interactions with both Clients and Colleagues that reveal the Expertise, Solutions, and Business Success of Realtors. The most natural Platforms that are conducive to Real Estate are of course Facebook, Twitter, and Pinterest; but some forget YouTube, Google+, and LinkedIn. Consistency and Engagement form the foundation Pillars of Social Media. Spiders or Web Crawlers: Search Engine use special programs called bots to crawl the web, in order to find content so they can index and rank it. 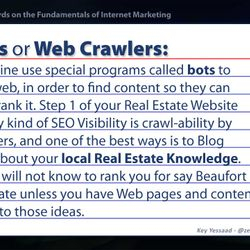 Step 1 of your Website gaining any kind of Real Estate SEO Visibility is crawl-ability by these Spiders, and one of the best ways is to Blog Regularly about your local Real Estate Knowledge. These bots will not know to rank you for say Beaufort SC Real Estate unless you have Web pages and content that speak to those ideas. Squeeze Page: It is a type of Landing Page that contains a Registration Form. Real Estate Marketers will need an item of value, report, or educational video that visitors would request by filling out the form. Typically most Real Estate Websites would offer the ability for consumers to request a Comparative Market Analysis of their Home before they put it up for sale; that is a type of a Squeeze Page. Unfortunately very few Real Estate Agents use Web Forms creatively. Sub-Domain: It is a Domain that is part of a larger parent domain as in mike.example.com. 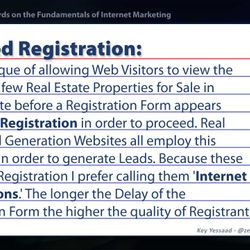 Real Estate Lead Generation Websites employ this method to offer agents their own section of the website to which they can direct traffic, then login and work their Real Estate Leads. 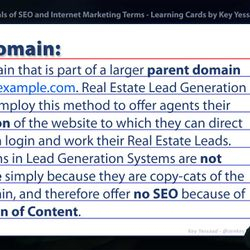 Subdomains in Lead Generation Systems are not index-able simply because they are copy-cats of the main domain, and therefore offer no SEO because of Duplication of Content. Sync: Comes from Synchronization, or the process of having up to date information regardless of the devices or the input method. 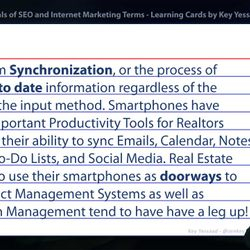 Smartphones have become important Productivity Tools for Realtors because of their ability to sync Emails, Calendar, Notes, Contacts, To-Do Lists, and Social Media. Real Estate Agents who use their smartphones as doorways to their Contact Management Systems as well as Transaction Management tend to have have a leg up! 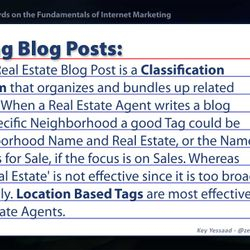 Tagging Blog Posts: A Tag in a Real Estate Blog Post is a Classification Mechanism that organizes and bundles up related Blog Posts. When a Real Estate Agent writes a blog about a specific Neighborhood a good Tag could be the Neighborhood Name and Real Estate, or the Name and Homes for Sale, if the focus is on Sales. Whereas the Tag 'Real Estate' is not effective since it is too broad conceptually. Location Based Tags are most effective for Real Estate Agents. 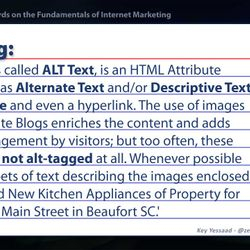 Title Tag: An important HTML Page Attribute that defines the main topic of a Web Page, and is used by Search Engines and Web Visitors. It also appears at the Top Bar of Web Browsers, and the first 10 words or 60 characters are displayed by Search Engines in their Results. 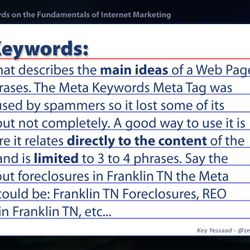 Real Estate Agents should try to make their Titles as unique as possible, incorporate the primary keyword within the first 10 words of the title, and stay relevant to the content of the Web Page. 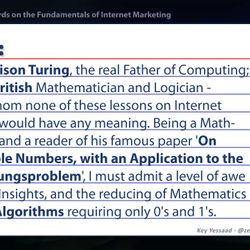 Turing: Alan Mathison Turing, the real Father of Computing; a Genius British Mathematician and Logician - without whom none of these lessons on Internet Marketing would have any meaning. Being a Mathematician, and a reader of his famous paper 'On Computable Numbers, with an Application to the Entscheidungsproblem', I must admit a level of awe at Turing's Insights, and the reducing of Mathematics to proper Algorithms requiring only 0's and 1's. URL: Acronym that stands for Uniform Resource Locator, or simply Web Address. Every Web Page, Picture, Video, and Web Object has a unique URL. You can find the URL by using a Browser Software that will make it visible in the Browser Window and usually starts with http://..., www..., or something similar. Real Estate Agents who blog regularly will offer hyperlinks that point to URLs in their website relating to Listings, Neighborhoods, Lists of Homes for Sale, etc. Vlogging: Another way of saying Video Blogging - the layer above blogging with just text; it allows Real Estate Agents to reveal their true Local Expertise. 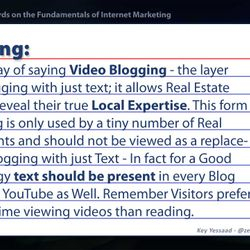 This form of Blogging is only used by a tiny number of Real Estate Agents and should not be viewed as a replacement to Blogging with just Text - In fact for a Good Real Estate SEO Strategy text should be present in every Blog Post and in YouTube as Well. Remember Visitors prefer spending time viewing videos than reading. 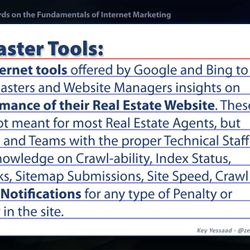 Webmaster Tools: A set of internet tools offered by Google and Bing to give Webmasters and Website Managers insights on the performance of their Real Estate Website. These tools are not meant for most Real Estate Agents, but Brokerages and Teams with the proper Technical Staff can gain knowledge on Crawl-ability, Index Status, Broken Links, Sitemap Submissions, Site Speed, Crawl Errors, and Notifications for any type of Penalty or Major Error in the site. 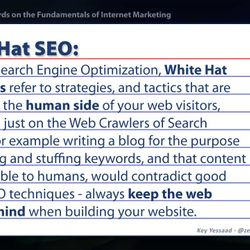 White Hat SEO: In SEO, or Search Engine Optimization, White Hat Techniques refer to strategies and tactics that are focused on the human side of your web visitors, rather than just on the Web Crawlers of Search Engines. 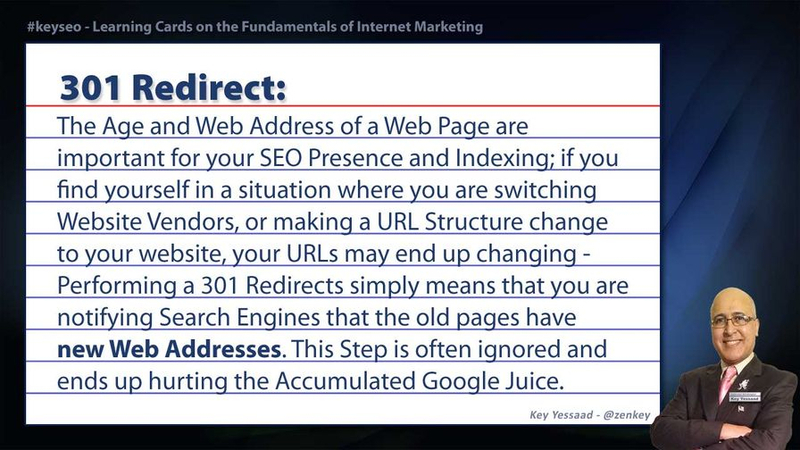 For example writing a blog for the purpose of repeating and stuffing keywords, and that content being illegible to humans, would contradict good organic SEO techniques - always keep the web visitor in mind when building your website. 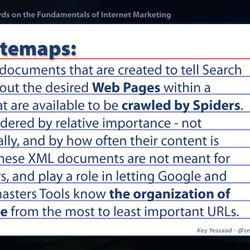 XML Sitemaps: Organized documents that are created to tell Search Engines about the desired Web Pages within a website that are available to be crawled by Spiders. They are ordered by relative importance - not alphabetically, and by how often their content is updated. These XML documents are not meant for Web Visitors, and play a role in letting Google and Bing Webmasters Tools know the organization of the website from the most to least important URLs.